PORTLAND, Ore. -- A big spring rise in the Columbia River basin has finally washed out to sea, meaning that turbines in the region's wind farms are back at full output. 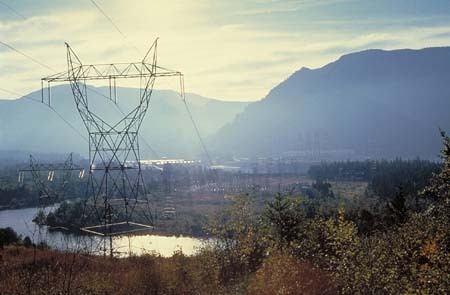 While the basin was awash in runoff from heavy mountain snows and a cold, late spring, generators at dams in the region were producing electricity at full tilt. At night and on weekends, when demand was low, the Bonneville Power Administration ordered wind farms to shut down, saying there was more electricity than the region needed or could export. Barring something unforeseen, the agency is finished with curtailments this year, spokesman Michael Milstein said Monday. He said they amounted to slightly more than 6 percent of the wind farm's potential output since mid-May. The decision shifts attention to the wind developers' complaint before federal regulators against Bonneville, a federal agency that both markets hydropower and controls a large share of the region's transmission lines. Wind companies say Bonneville has used its monopoly power and broken its contracts with wind farms to deliver their electricity. Bonneville's decision has far-reaching implications for Northwest wind farms, said Jan Johnson, a spokeswoman for Iberdrola Renewables, a major developer in the region. The wind industry has been nurtured by state requirements and federal incentives, including some pegged to output. If contracts to deliver the power can't be trusted, "it will ultimately be the death of the industry," she said. The Federal Energy Regulatory Commission hasn't taken action on the complaint against Bonneville by Iberdrola and other major players. Both Bonneville and wind interests confirm that they're negotiating. This year's spring runoff was even larger than expected a few months ago. National Weather Service statistics show the volume is the third largest in the past four decades and the largest since 1997. "Our flows are still higher than they would typically be," said Andy Bryant, a Weather Service hydrologist. "We're not going to get down to our base summer level until late August." Milstein said the nuclear plant whose power Bonneville markets is still offline, undergoing refueling, and operators of natural gas and coal-fired generating stations are ramping up their output. Those plants typically schedule down time in the spring when hydropower capacity is high. As the water rises, federal managers have fewer choices about managing rivers in the Columbia basin. The more water they allow to go through spillways rather than into power generators, the more they create dangerous water conditions for threatened salmon and other fish.